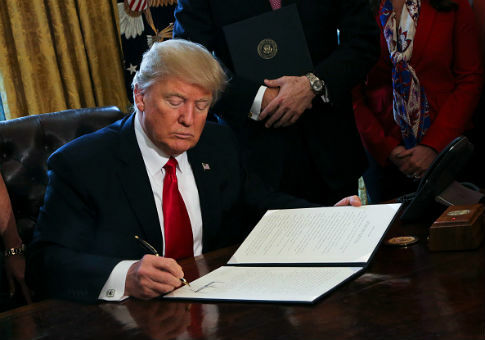 President Donald Trump on Wednesday signed an executive order that authorizes new sanctions on foreign countries or individuals that try to interfere in U.S. elections. Director of National Intelligence Dan Coats and White House national security adviser John Bolton discussed the order in a briefing with reporters. "It's a further effort, among several that the administration has made, to protect the United States against foreign interference in our elections and really our political process more broadly," Bolton said. "We felt it was important to demonstrate the president has taken command of this issue—that it's something he cares deeply about." Coats added that, while the order is a response to Russia's interference in the 2016 presidential election, the Trump administration is looking beyond Moscow. "We have seen signs of [meddling from] not just Russia, but from China … from Iran and even North Korea," he said. "We're taking nothing for granted here." Coats warned last month that Russia is trying to interfere in the 2018 midterm elections. "In regards to Russian involvement in the midterm elections, we continue to see a pervasive messaging campaign by Russia to try to weaken and divide the United States," he said. Under the new order, titled "Imposing Certain Sanctions in the Event of Foreign Interference in a United States Election," the intelligence community will have 45 days after each election to assess whether any foreign actors meddled. The intelligence agencies will then send their findings to the Department of Homeland Security and the Department of Justice, which will have another 45 days to decide whether the U.S. should impose sanctions on the foreign entities in question. Following those reports, the Treasury and State Departments can decide on appropriate and additional sanctions to impose. The order defines election interference in broad terms, going beyond direct hacking into election systems to include influence operations on social media—such as distribution of propaganda and disinformation—and the release of hacked political documents. The announcement on Wednesday surprised some officials on Capitol Hill, who noted that no drafts of the order had been discussed with Congress prior to the signing. Still, some action on election interference had been anticipated. The White House publicized last moth that the National Security Council examined the issue twice with Trump presiding. Some lawmakers expressed dissatisfaction with the new executive order. Sens. Marco Rubio (R., Fla.) and Chris Van Hollen (D., Md.) criticized the measure for not going far enough. "Today's announcement by the administration recognizes the threat, but does not go far enough to address it," they wrote in a joint statement. Both lawmakers previously proposed legislation that would impose mandatory sanctions on those who interfere in U.S. elections, rather than directing various departments and agencies to go through a months-long process. This entry was posted in National Security and tagged 2016 Election, 2018 Election, Cyber Security, Donald Trump, Russia. Bookmark the permalink.